Football Manager 2018 wonderkids complete list with recommendation ratings. 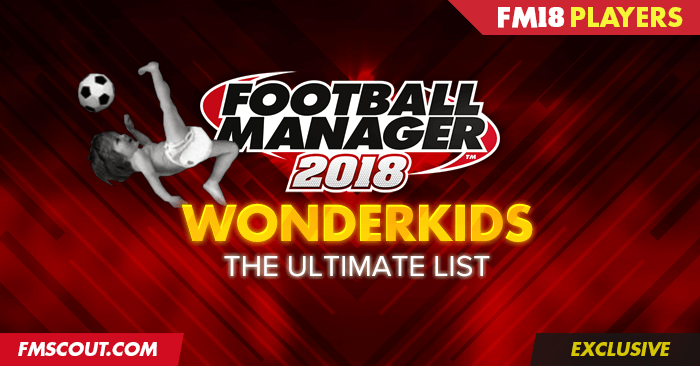 Discover all Football Manager 2018 wonderkids and best FM18 young talents. This will, as always, be the most informed and comprehensive list of Football Manager 2018 wonderkids you will ever find. When it comes to wonderkid lists, you already know FM Scout is the go-to place for maximum accuracy and detail. As you have learnt to expect from us, you will also find the usual unique features that add unparalleled depth, insight and functionality. More than 650 players included. Looking for Football Manager 2019 Wonderkids? Wonderkids can be classified players with high potential ability (having at least a PA of 150) who are not older than 20 years old by July 1st, 2017, in-game. This list features the best young players in FM18. Some of them will already be labelled as wonderkids, others should be pretty close to getting there, and others will struggle to live up to their potential before they turn 21 years old (late bloomers). This is my personal recommendation system for your convenience. It's my own assessment of the potential development of the young players listed below. I'm using a 1-100 scale based on English divisions. Most players have PA of -8 which means they won't always have 150+ in your savegame. There are players with PA of -85, -9, -95, -10 or fixed at 150+ (guaranteed wonderkid potential), and some others with PA fixed slightly below 150 who have impressive quality. There are just two -10 players in Football Manager 2018 (Donnarumma and Mbappe). I have opted to use 4 classes of wonderkids this time, color-marked for your convenience. I've been on a hurry to get this list published, and some players might not be placed under their natural positions exactly. Click on the table headers (name, age, etc) for easy sorting. Press and hold Shift while clicking the headers to sort by multiple columns. You can filter players by any data you like from all tables below, such as ratings, names, nations, clubs and wages. Start typing and matching results will be shown in real-time. For example, typing "Brazil" will show you all Brazilian wonderkids. Added with Revision 1 (October 27th). Updated with Revision 8 (March 22nd). Added with Revision 1 (October 27th). Updated with Revision 9 (March 23th). Added with Revision 1 (October 27th). Updated with Revision 10 (March 26th). Added with Revision 1 (October 27th). Updated with Revision 11 (March 27th). Added with Revision 1 (October 27th). Updated with Revision 12 (March 30th). Added with Revision 1 (October 27th). Updated with Revision 13 (March 31st). Added with Revision 1 (October 27th). Updated with Revision 14 (March 31st). Added with Revision 1 (October 27th). Updated with Revision 15 (April 1st). Added with Revision 1 (October 27th). Updated with Revision 16 (April 6th). Added with Revision 1 (October 27th). Updated with Revision 17 (April 6th). I can't find all players of this list on my savegame. Why? I loaded all players (330k+) in-game to produce this list of FM18 wonderkids. Your savegame probably has less players loaded. Where is the downloadable shortlist to import in-game? In recent years I would not share a downloadable shortlist because people would steal them and post on other sites without my consent. However, I will release a few shortlists with my favorite players. I started FM Scout for fun in the distant 2004. I'm proud of how this place has grown into a vibrant community and I try my best to improve it every year. Husband and father of two. 42 comments have been posted so far. Ben Woodburn is Welsh isnt he? fixed transfer fee? For example odegaard has a 18 mio fixed transfer. ? That whout be nice,. @Mu81n @tkosergio: Appreciate the kind words, thank you! I intend to prepare a couple of downloadable shortlists with my favorite picks over the next few weeks, or at least do the "Wonderkids Best XI" with first and second team. Merci! Belle liste qui inspirera tous les fans de FM! The list has been totally revised for 18.3 as of last night. Any suggestions / questions welcome. Stam, some players in the white segments better than players in the coloured segments. It is like that in every game, every career. Can you explain this? For example, Abdou diakhate, Diop issa. they should be blue segments at least. 18.3 revision for central midfielders is now live. Nacho Mendez, Gaspar and Matteo Guendouzi are some of the most notable new entries. Revisions for DM and FBR were previously added unannounced. Make sure to check them out as well. @Sarm: Actually I had updated right full-backs as well, and now I've just finished defensive midfielders. The main reason for struggling to stick to my planned timeline is my family getting the flu. Stam: "Will make sure you get at least 1 revision a day from now on, until all positions are covered". 8 days after this comment/post, you are update GK, DC, DR and DL positions. That's 0.5 revision per day (not "at least 1"). You are not do any revision in saturday, sunday (and that's ok), but why wednesday and thursday? 18.3 revision for left full-backs is now live. Almost no new entries, with Athirson being the most notable. Will revise right full-backs today. @Herrjensen: The way negative PA works has never changed. They just introduced some values in-between last year (-95, -85, etc). @Mu81n: SI always release 1 data update every year; the one for winter transfers. All sorts of data can change, not only PA. Regarding Mannion, I might add him back as he's on a fixed PA of 145; which is lower than the 150 limit, but sometimes I include certain players with fixed PA between 145-149. Hmm Stam, great list but I can't help but wonder if they changed how negative PA works? It used to be that -10 = 170-200, -95 = 160-190, -90 = 150-180, 85 = 140-170 etc. Did they change that? This may be very obvious-but I’m assuming you’re doing the update as SI have released an update on the game, hence the PA’s will also change? 18.3 revision for centre-backs is now live. Benkovic, Montiel and Caleta-Car are some of the most notable new entries. 18.3 revision for goalkeepers is now live. New additions have a "18.3" mark next to their names. Lunin and Woodman are the most notable new entries. Will make sure you get at least 1 revision a day from now on, until all positions are covered. @agent: What "other player potential page" are you referring to? Quick heads up: I'll initiate the 18.3 revisions tomorrow. Thanks everyone for over 1.3 million views so far! @arsenalthebest: Vanheusden is -85, which means he'll randomly get a PA 140-170 on every save. There are 3 Vitinho's. The midfielder at Barcelona, the right back at Cruzeiro and the midfielder/forward at Corinthians. Not sure why you can't find him with Brazilian league loaded. Perhaps try loading all players of Brazilian nationality via the advanced database size settings. Vitinho does not appear i have the brazilian national first division loaded and have checked all of Corinthians squad squads as well as their transfers but he doesn't appear to be there what have i done wrong? Handcrafted in Symi, Hellas. Page created in 0.786 seconds.